Warner Bros. Interactive Entertainment today announced Scribblenauts™ Mega Pack, a new two-game collection featuring full versions of Scribblenauts™ Unlimited and Scribblenauts™ Unmasked: A DC Comics Adventure along with bonus content for both games. It will be available September 18th for Nintendo Switch™, PlayStation® 4, PlayStation® 4 Pro, Xbox One and Xbox One X with a RRP of £24.99. Scribblenauts™ Unlimited fosters unlimited creativity, exploration and social elements that create a fun experience for fans of all ages. The game features a huge side-scrolling open world with high-definition, hand-drawn scenery and objects where players can help the game’s hero, Maxwell, solve robust puzzles and challenges by summoning any object they can imagine. 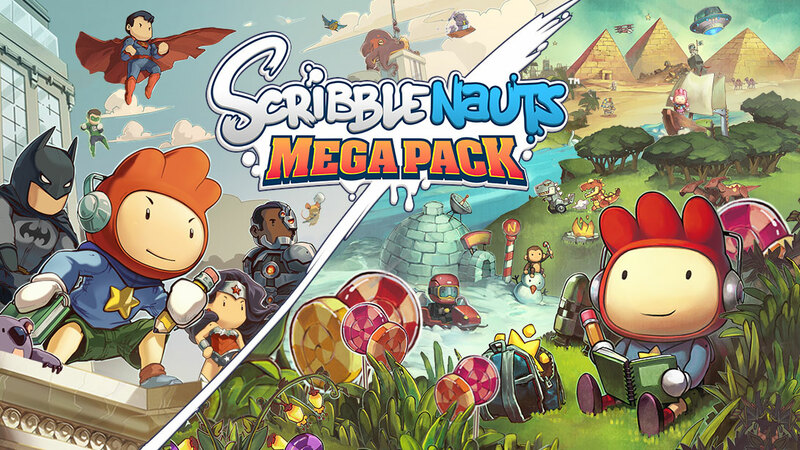 Scribblenauts™ Unlimited has been updated with two new bonus levels, supports online sharing of user-created objects, updates two-player mode, and features a new easy-to-use “sunflower” style text entry system. The new Zed Zeppelin level lets players battle sky pirates and work with crew members to keep the dirigible safe while the new Land of Sweet Hyperbole level allows players to drive around in a candy car and interact with candy neighbours. Scribblenauts™ Unmasked: A DC Comics Adventure melds the boundless creativity of Scribblenauts™ with thousands of DC characters and objects - all drawn in the distinctive Scribblenauts™ art style. In the game, Maxwell comes to the aid of the mightiest DC Super Heroes BATMAN™, SUPERMAN™ and the rest of the JUSTICE LEAGUE™ as they face the fiercest DC Super-Villains, such as THE JOKER™, LEX LUTHOR™ and SINESTRO™. Fuelled by the player’s imagination, where anything they write comes to life, Maxwell must use his magic notebook to summon heroes and tools to stop the villains' evil schemes and save the universe. In his imaginative and comical quest, he must travel to iconic DC locations such as GOTHAM CITY™, METROPOLIS™, ATLANTIS™ and two new bonus locations, TITANS TOWER, under attack by the formidable demon Trigon, and BELLE REVE, the base of operations for the Task Force X. Scribblenauts™ Unmasked: A DC Comics Adventure has also been updated with hundreds of new DC characters, objects and costumes. We never did get Scribblenauts™ Unmasked: A DC Comics Adventure in Europe on Wii U. There was an Australian PAL release but that was a very limited release and I believe it sells for quite a lot on sites like Ebay.